Using its long-serving Long March 3B rocket, China sent another pair of BeiDou-3 spacecraft for the country’s homegrown satellite navigation system on Monday, November 19 (local time). This is the eighth time this year that Beijing has launched a BeiDou-3 duo to replenish its navigation network. Very little information was revealed by Chinese media about pre-launch preparations. While the date of the launch was known, the exact liftoff time remained undisclosed. Only a brief notice was issued to airmen (NOTAM) on Nov. 16 which offered some indications as to when exactly the launch would take place. The mission’s success was confirmed by the state-owned Xinhua press agency, nearly five hours after lifting off. Each BeiDou-3 MEO satellite weighs about one metric ton, has two deployable solar array and is designed to be operational for about 12 years. The dimensions of a spacecraft of this type measure: 7.38 by 3.28 by 4.0 feet (2.25 by 1.0 by 1.22 meters). Named after the Chinese term for the plough or the Big Dipper constellation, the BeiDou (BDS) project was formally launched in 1994. The first BeiDou satellite was sent aloft in 2000. By 2012, a regional network had begun to take shape, which provided positioning, navigation, timing, and short message services in China as well as several other Asian countries. 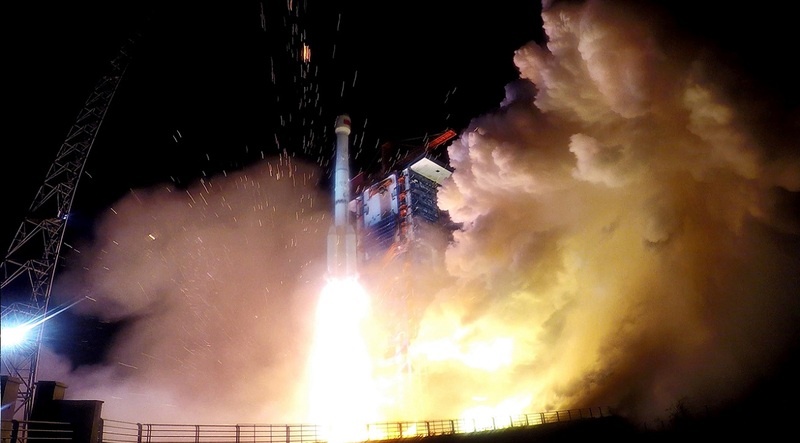 The first BeiDou-3 satellite was launched in March of 2015. The two newly-orbited satellites are designed to work with the 17 other BeiDou-3 spacecraft already in space to provide services for countries participating in the Belt and Road initiative by the end of this year. “This is a key step for BDS developing from a domestic Chinese system to a regional and then a global navigation system,” said Yang Changfeng, chief designer of the BeiDou system. In general, China intends to have the BeiDou-3 constellation consist of some 27 BeiDou-3M satellites in MEO, five BeiDou-3G satellites in a geostationary orbit, and three BeiDou-3I satellites in an inclined geosynchronous orbit. By the end of 2020, Beijing expects that the system should become global, providing high-precision, reliable positioning, navigation and timing services anywhere in the world. Monday’s launch marked the 291st mission for the Long March rocket series and the 33rd flight that China has conducted in 2018.